The use of high tunnels to produce high dollar value crops such as tomato has dramatically increased in recent years. This increase in popularity partly is due to initiatives such as the USDA-NRCS EQIP program which subsidizes high tunnel purchase. Unfortunately, soil-borne diseases are becoming an increasing threat to their long-term use and profitability. There are several unique features surrounding high tunnels/greenhouses that tend to favor to soil-borne diseases. First, the high humidity and temperatures typical of the interior of these structures are ideal for pathogen growth. Additionally, the same production area is used year-after-year for the same crop (most often tomato) which favors the build-up of disease inoculum in the soil. Finally, pesticide options for the control of soil-borne diseases of vegetables are limited. In the past, control of soil-borne pathogens of vegetable crops was principally accomplished using soil fumigants such as methyl bromide. Due in large part to its adverse effect on the Earth's ozone layer, methyl bromide has been phased out of agricultural use. Replacement fumigants such as chloropicrin, Basamid® (dazomet), and Vapam® (metham sodium) are available. However, there are problems associated with their use. Synthetic chemical fumigants most often are applied as gases injected into the soil or as granules that release the active ingredient. Because of the inherent toxicity of chemical fumigants and the possibility of off-gassing from treated sites, the use of these compounds is rigidly controlled by the government. Applicators must be trained and certified to use these compounds in a legal manner. Additionally, they tend to be expensive. Thus, growers are seeking viable alternatives to replace traditional chemical fumigation as a means of managing soil-borne diseases. Biofumigantion represents one such alternative. Biofumigation involves the use of plants, mainly from the Brassicaceae (or mustard) plant family, to both control soil-borne diseases and improve soil health. Many members of the mustard family contain compounds known as glucosinolates (GSLs). The latter are organic compounds that contain sulfur and are responsible for the pungency in crops such as mustard, cabbage and horse radish. They are present in the stem, leaves, roots and seeds of plants containing them. Upon hydrolysis after plant tissue has been incorporated into the soil, the GSL contained releases chemicals known as isothiocyanates. Isothiocyanates have both fungicidal, nematicidal and weed suppressive properties. Methyl isothiocyanate, a synthetic isothiocyanate, is the compound that serves as the active ingredient for chemical soil fumigants such as metam sodium. Thus, the same toxic compound found in synthetic fumigants can be supplied by plants, but at much lower concentrations. Biofumigants, therefore, pose much less risk to the environment and carry fewer governmental regulations. Recent studies have demonstrated that growing brown mustard (Brassica juncea) as a cover crop and then thoroughly incorporating it into the soil can reduce weed pressure, parasitic nematodes, and soil-borne pathogens (e.g. Pythium, Rhizoctonia, Sclerotinia. Verticillium & Phytophthora). The mode-of-action is much the same as with chemical fumigants, but on a greatly reduced scale. The use of mustard as a biofumigant can be accomplished in two ways: 1) grow it as a cover crop and incorporate it into the soil, or 2) apply mustard meal derived from ground mustard seeds and incorporate it into the soil. Strains of mustard selected for high GSL content are commercially available for use as biofumagants. Rupp Seeds (800-700-1199) markets the Caliente series of mustards which have been used successfully in university trials. Alternatively, Mighty Mustard® (509-487-0755), a Washington-based company, markets its own series of biofumigant mustard. It must be noted, because of their high GSL content, biofumigant mustards are not suitable for livestock grazing. After a suitable seedbed is prepared, biofumigant mustards are broadcast seeded at the rate of about 10-15 lbs./acre, or .5 lbs./1,000 sq. ft. Lightly working the seeds into the soil improves germination which occurs in about five to seven day, depending upon soil temperature. The greater the plant growth, the greater the amount of GSL available for soil incorporation. Therefore, adequate water should be supplied and other best management practices followed. The GSL concentration in mustard plant material is at its highest just before full-bloom (about 60-80% of the plants are flowering). At this time the above-ground growth must be chopped as finely as possible. GSL release increases as plant particle size decreases. If available, the use of a flail mower is recommended in order to shred the plant material thoroughly. Immediately after shredding, the biofumigant crop should be incorporated thoroughly into the top five to eight inches of soil using an implement such as a rotary tiller, and not simply turned under with a plow. Research has demonstrated that 80% of the GSL present in the plant tissue shredded will be released within 20 minutes after mowing. Therefore, time is of the essence. 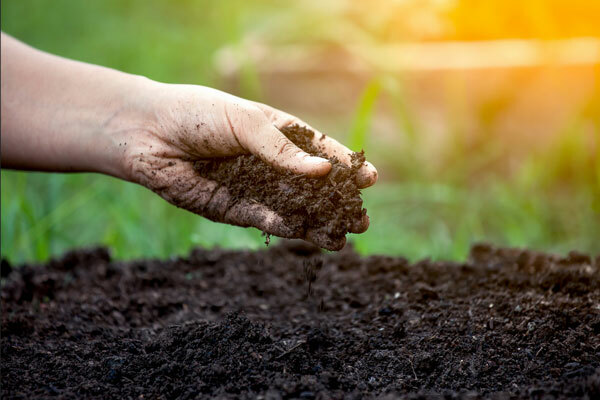 Once the plant material has been incorporated, the soil should be watered and sealed with a tarp or sheet of plastic to trap the GSL and its breakdown gases in the soil. After 14 days have passed, the tarp/plastic may be removed, since all of the plant material will have decomposed by that time. Attempting to plant the area prior to the passage of two weeks could result in significant crop injury or hinder seed germination. Alternatively, mustard meal such as Pescadero Gold™ (831-763-3950) can be used to incorporate GSL into the soil instead of growing mustard plants. While this practice is more expensive, it will result in a higher amount of GSL being released into the soil resulting in superior disease control and weed supression. Using this method, 1 lb. of mustard meal per 45 sq.ft. of soil is applied and thoroughly incorporated into the soil. As above, water the soil and seal with a tarp or layer of plastic, in the case of mustard meal, for at least three weeks. Depending on mustard strain and supplier, biofumigant mustards seeds for a 30 x 100 ft. high tunnel would cost less than $10. Mustard meal (Pescadero Gold) would cost about $130, if purchased in 50 lb. bags. In summary, biofumigation tends to suppress rather than totally eliminate soil-borne pathogens as do chemical fumigants. Therefore, it must be used as part of an integrated disease management program. The elimination of diseased tissue, crop rotation and (when available) the use of resistant varieties should be considered as reduce crop loss from soil-borne diseases.